Anything, but anything, can be used as a genealogical source. So… how about historical markers? You know… those signs by the side of the road that tell us that, oh, George Washington slept here or the like. No, The Legal Genealogist isn’t seriously suggesting that historical markers should be cited in our databases. But as we prepare to research our families in an area, particularly an area new to us, we can surely include them in our travel plans and consider them as clues to the lives and times of the people in the area, along with things like entries on the National Register of Historic Places and on the list of National Historical Landmarks. 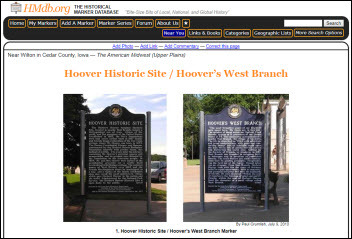 So as I prepare to head out to Iowa for this weekend’s Annual Fall Conference of the Iowa Genealogical Society in Pleasant Hill, I checked out some resources for historical markers and the like in Iowa. There are 19 markers ranging from the Historic Iowa City / Mormon Handcart Trail – 1856 marker in Wilton in Cedar County to the Historic Northern Iowa / Carrie Lane Chapman Catt – (1859 – 1947) marker in Northwood in Worth County. On the website, each one is photographed, the inscriptions — front and back — transcribed, information about the marker and others in the area given, and location data provided. The State Historical Society markers aren’t the only ones in Iowa — not by a long shot. There are now 96,387 markers on the Historical Marker Database from all over the United States (so you can look here even if you’re not doing Iowa research) — and a search of the database turns up 430 results in Iowa alone, starting with the First Train Robbery in The West: Jesse James Robberies marker, put up in 1964 by the Rock Island Railroad in Adair, Adair County, and going through to the Quasdorf Blacksmith and Wagon Shop 1899 marker in Dows in Wright County indicating that that building is on the National Register of Historic Places. If you only want the markers showing places that are on that National Register, head on over to the website of the National Register of Historic Places from the National Park Service. Research there isn’t the easiest, because its files are in the process of being digitized, but you can check the National Register of Historic Places NPGallery Database and the 2013-2016 weekly list for updates. If you want to see the properties listed as National Historical Landmarks, head over to the National Park Service website for the National Historical Landmarks. There, you can search by state and, if you look at Iowa, you’ll find 26 listed ranging from the Amana Colonies in Iowa County to the Woodbury County Courthouse in Sioux City. These sorts of things mark Iowa’s history — and the history of every state in which we research. Historical markers as genealogical clues. Ihave found Historic Markers helpful. I found a couple in Florida that informaed me about a branch of my family that I had entirely missed! I have also found a few others that increased what I knew about two or three other branches. When I find these markers, I have more information to research and that has led to other discoveries. I have always enjoyed Historic Markers but since I began researching my family they have become even more interesting and infomative.